— This article by Jerry Cates, first published on 15 March 2010, was last revised on 18 April 2016. © Bugsinthenews Vol. 11:03(16). 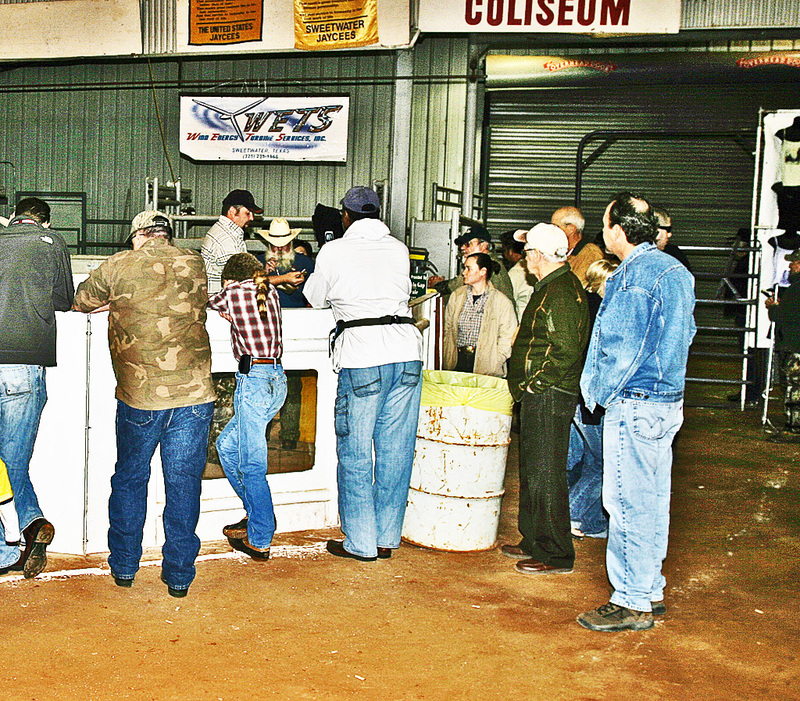 At about 10:15 A.M., the Nolan County Coliseum loudspeaker announced that the rattlesnake roundup guided hunt was about to begin. All the registered hunters gathered at the back of the coliseum to await further instructions. The guide for this hunt was Eddie Gomez, an experienced rattlesnake hunter of considerable repute. Several Roosters had already informed me that, if Eddie was in charge, the hunt would likely be successful. 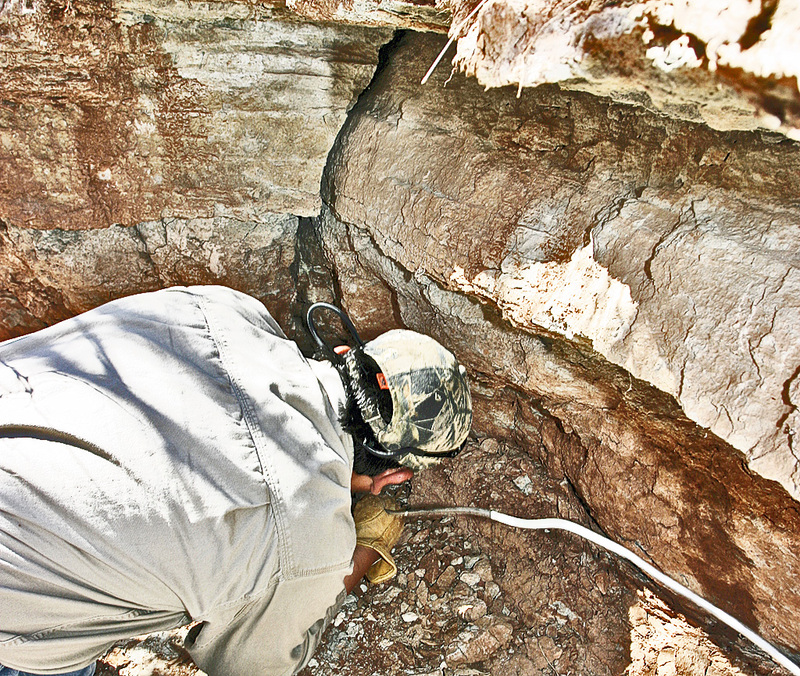 He knew his stuff around rattlesnakes: where to look for them, how to find them, and how to entice them to willingly come out of the deep cracks in the west Texas rocks they lived and “hibernated” in. Of course, snakes don’t really hibernate in the technical sense, but merely reduce their energy usage and “chill out” during the winter months. They do this in hibernacula, or cryptic voids in rocks, underground caverns, and other out of the way places where temperatures remain relatively constant during the winter. Eddie told the assembled group to meet up at the Wal-Mart on Interstate 20. There we’d buy food for our lunch on the trail, a small hand-held mirror if we didn’t yet have one, and individual snake containers–one per hunter–that we’d need for collecting our catch. It was recommended that we buy, at minimum, a 5 gallon plastic pail with a lid. Some of the more optimistic among us bought large, 35-50 gallon trash barrels. I chose a six gallon plastic pail that I’d brought with me from Round Rock–it wasn’t too large to pack into the underbrush all day long, nor too small to enable an irritated, thick-as-your-arm rattler to jump out the moment the lid came off. Once those chores were done, and the hunter’s roll was called, the trek to the site of the hunt–a large ranch outside of Sweetwater–commenced. Like a dark funeral procession (we drove with our headlights off), we herded our personal vehicles in a long line with Eddie in the lead. A few miles outside of town the stream of vehicles veered off the paved thoroughfare onto a red dirt road that meandered into the flat west Texas countryside. Mesquite trees, tallgrass prairie, and huge stands of prickly pears, choked with anemic, pencil-thin stalks of tasajillo mixed with thicker stalks of cholla, were all that could be seen for miles around. That thought would be revisited, with a slightly different feeling, when the hunt was done. Eddie surveyed the motley group arrayed before him with a practiced eye and pronounced everybody present. Mike, Eddie’s assistant, took half of the group and ambled down the road we’d come in on, to begin searching that portion of the canyon for rattlesnakes. Eddie took the other half that I was in, and marched directly into the cactus, to the edge of the canyon where a small trail dropped steeply downward. The trail was about as wide as a mountain goat would find likeable, with prickly pear and tasajillo lining each side. Not exactly the kind of stuff for a hand hold, in case of a fall. At the bottom, walking the dry river bed, the steep sides of the canyon stretched upward, above us. On either side the walls were of soft, decayed limestone mixed with iron-rich, sandy clay and thin layers of calcite. The further we walked, the deeper, and wider, the canyon became. Before long we rounded a turn in the dry river bed, and came upon Eddie Gomez, on his belly up against the side of the canyon wall, peering into a rock crevice. 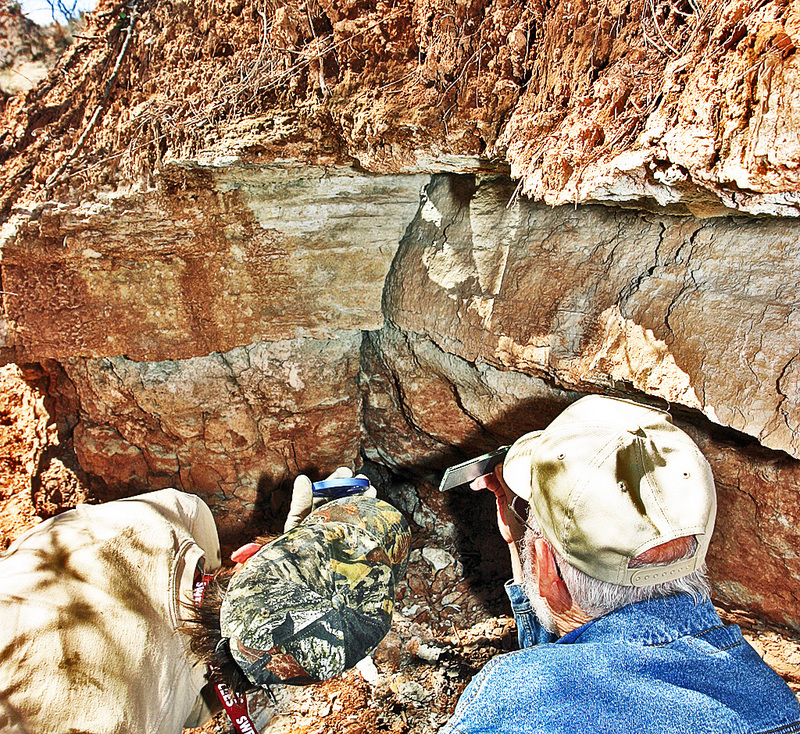 Such crevices — ranging from half an inch to two inches wide — were fairly common here, and stretched deep into the rock. To see what might be occupying a particular section of crevice, Eddie used his hand mirror to reflect a bright ribbon of sunlight inward. Of all the tools a rattlesnake hunter must have, a small hand mirror — one about the size of a moderately large compact— is at the top of the list. Sunlight reflected off the mirror’s face lights up the crevice to its deepest depths, a feat not even the brightest flashlight can accomplish. Of course, a mirror is only suitable if the crevice you are working has reflectable sunlight nearby, so on an overcast day, or on the side of a cliff that is out of the sunlight, it becomes worthless and a strong LED flashlight might become quite handy. The new LED lamps, with high-lumen-output and low battery consumption, have the potential to light up a crevice somewhat, but they are still no match for good, mirror-reflected sunlight. I compared the light from my 6-watt LED lamp and that from a mirror, in Eddie’s crevice, and my LED lamp was no match; the mirror won the contest, hands down. He stood up and gave us room to inspect the crevice, one by one, with our hand mirrors. 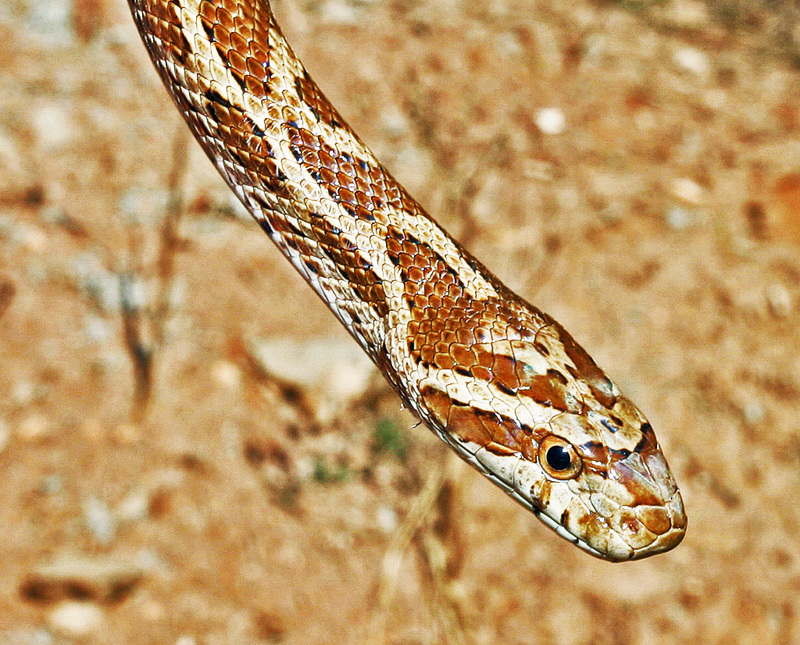 The corn snake (Elaphe guttata guttata), a harmless ratsnake with randomly placed golden flecks mixed with darker chunks of coloration in its belly scales, was lodged in the crevice directly above my head as I peered upward. Turning the mirror, I flashed sunlight into the 3/4th-inch-wide crack to the left. The crack was at least seven or eight feet deep. At its deepest recesses the coil of another snake was showing, its lateral surfaces bearing the checkered pattern of a western diamond-back rattler. Below it, the tip of a rattle stuck out into the crevice. It was impossible to tell if the rattle was associated with the snake coiled above it, or with another snake whose body was hidden from view. In the photo to the left, it is possible to make out the bodies of at least two rattlesnakes, including — in one case — the rattle at the tip of the tail. 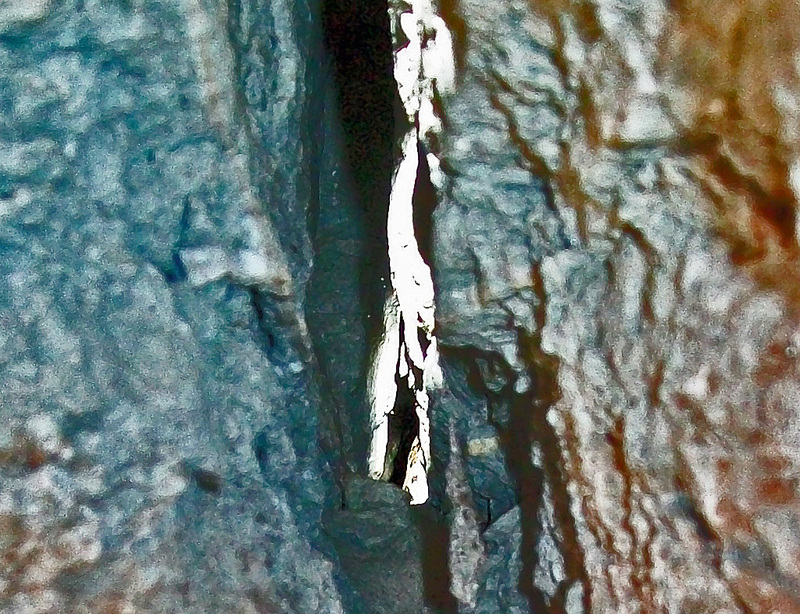 The image is of poor quality, as I had to place the camera lens in the crevice, shine sunlight into the depths of the crack with a hand mirror, and press the camera’s button without being able to preview the scene being photographed. The autofocus function worked better than expected, however, and — particularly if you allow your imagination some latitude — some of the features of the snakes can be seen. The visual effect, to the naked eye, was much clearer than the photograph shows. It was clear to my eye that the rattle was attached to a live snake, and that the markings on the skin of the snake being observed were consistent with that of a western diamond-backed rattler. After taking the photograph I moved closeer so my eye could scan the crevice depths. From time to time the snake’s rattle would vibrate gently, without making a sound. The rattler attached to it knew we were there, and appeared to be getting slightly agitated. But for the moment it was deep in the rock, far from harm’s way, seemingly as far from being captured by this little band of amateur rattlesnake hunters as if it were safely ensconced in a deep crack the next county away. About that time, Eddie called Mike on his phone, asking for an injector. Soon Mike arrived, holding a 2-gallon nylon pump-up spray tank attached via flexible hose to a coil of 1/4th inch aluminum tubing. Mike pumped up the spray tank. My own experiences with similar fluids told me this was a long shot, at best. Ammonia is one of the natural products of tissue decomposition, and rattlesnakes–among others–are attracted to putrefying flesh by sensing the presence of ammonia and other putrefaction by-products. That is one of the reasons why sulfur and naphthalene are not very effective deterrents to snakes that consume decaying flesh. But I held my tongue. Maybe this stuff would work. Once he had the tubing positioned where he wanted it, he told Mike to open the valve while he remained next to the crack as the ammonia was metered through the tubing. We asked how fast it should work. If the snakes were expected to start pouring out of the crack in large numbers, we wanted to be ready. He waited a few minutes, standing a few feet from the crevice, then knelt down and, with a hand mirror, inspected the mouth of the crack. “Nothing yet,” he reported. Inching closer, he shined sunlight deep into the crack. “The snakes haven’t even moved,” he muttered, a tinge of disappointment in his voice. “Maybe we need to get the regular gas,” Mike offered. My thoughts exactly. I was reluctant to say anything, and — as it turned out — my two cents worth were not needed. After a few minutes longer, Eddie reinspected the crevice and announced that the snakes had still not moved. That’s when he told Mike to clean out the sprayer and put in some unleaded gasoline. Once that was done, and about 4 ounces of gas was pumped through the tubing, Eddie leaned close, watching the crevice carefully. A few minutes later he pointed toward the crack. “There’s the first one,” he whispered. A darkened, hocky-puck -shaped form–the rattlesnake’s head–began to emerge from the base of the crevice. Snake tongs were brought up, and Eddie instructed the handler to wait until the snake was about 18 inches out. Unless the snake was at least this far out of the crack, it would puff itself up, by inflating its primary lung, to make it almost impossible to do a clean extrication. The handler was also told to snag the snake at a place near the point of emergence, 14 to 18 inches below the head. That would secure the snake without harming it. Grabbing it further up the neck risked serious damage to the snake’s sensitive anterior vertebrae. 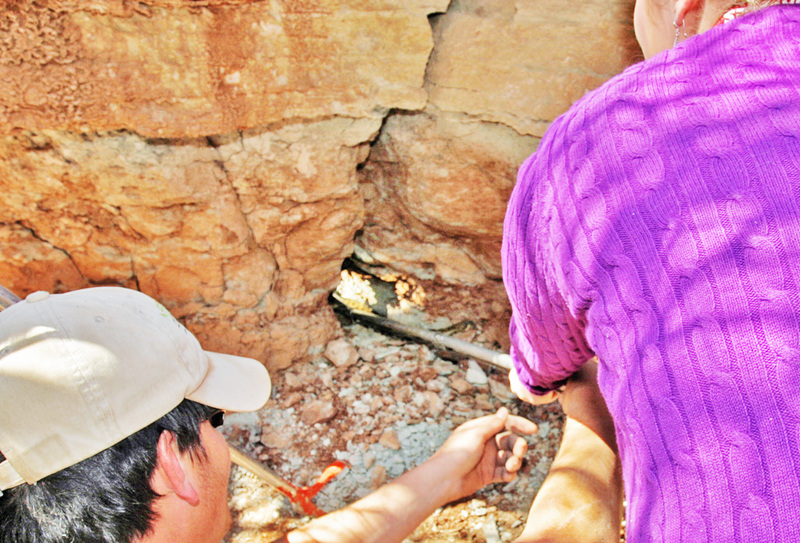 Once this rattlesnake was carefully snagged and deposited into a snake container, we continued watching the crevice. Soon a second rattlesnake emerged. Two ladies in the hunting party were elementary school teachers, and while one of them operated a video camera to record the event, the second wielded a set of snake tongs deftly, just as Eddie instructed. 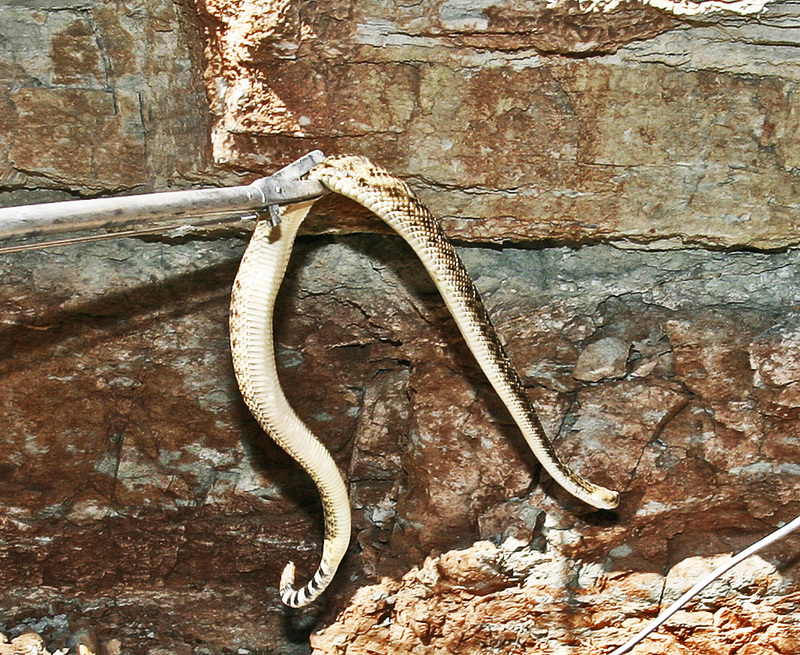 The snake was safely snagged, then lifted up and dropped into a container. It wasn’t long before a third snake emerged, this time not a rattlesnake but the corn snake that we had noticed earlier. 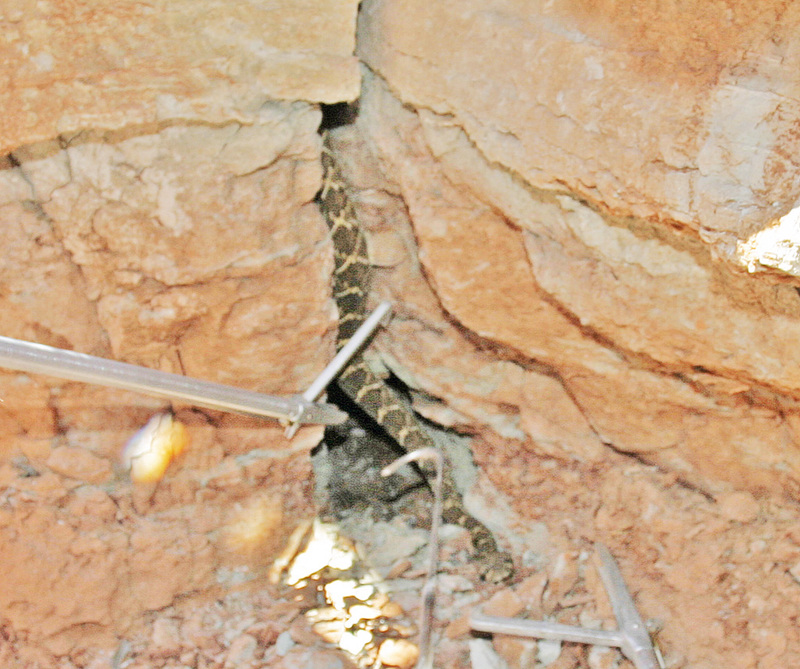 A member of the hunting party, after looking about to make sure no rattlesnakes were nearby, manually removed it from the crevice and carried it a safe distance away. Before long the snake was winding itself around the man’s torso, seemingly as tame as though it had been born in captivity. Rat snakes like this specimen coexist successfully with western diamond-backed rattlesnakes. Both species feed primarily on small mammals, such as mice and rats, and both are very efficient at keeping populations of such mammals in check. However, as long as rattlesnake populations are large, rat snake populations tend to suffer. By reducing the population of rattlesnakes on this ranch, the Sweetwater Jaycees help insure that rat snakes like this one will proliferate. The population of mice and rats will continue to be kept in check, just as before, but that work will be done by non-venomous rat snakes that pose absolutely no risks to humans, their pets, or their livestock. We waited again, eyes on the crevice. After another half hour had passed, a third rattlesnake appeared. As before, it was safely snagged and containerized. Eddie examined the crack thoroughly with a hand mirror once more.